Home » News » Win A Pass to Chroma Connect! We’re giving away two full weekend passes worth NZ$160 each for Chroma Connect, the creative summit that runs alongside the free art convention Chromacon. Chroma Connect is a two day series of discussion panels and lectures run by professional artists and industry professionals from comics, videos games, film, and graphic design. 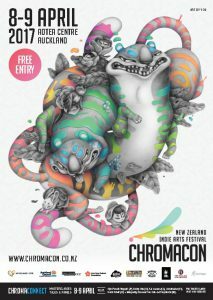 If you’re a New Zealand artist who will be in Auckland on the weekend of April 8th and 9th and would like to attend for free, send an email to [email protected] with ‘Chroma Connect Entry’ in the title and your name in the email itself (so we know who to put down on the entry list!) by midnight (New Zealand time) Sunday 2nd April. You do not have to be an ArtRage user, you just have to want to go! (We’d run an art contest, but there isn’t really enough time and we wanted to give as many people a chance in the draw as possible – but if you could take the time to check out our free Android app or the free desktop demo, we’d really appreciate it! Or come check us out at the event!). Put your full name in the email body (We need your real name for the tickets. We will announce the winners online so if you would prefer we use a different name publically, include that too!). Chroma Connect runs sessions throughout both days. Chromacon has free entry, so you can wander in and admire the art in between sessions! Ambient Design is sponsoring Chromacon 2017 and previously sponsored Chromacon 2015.